This is the popular Lentil soup. 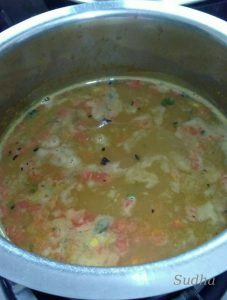 I recently came to know that it is the National Soup of India. Not sure if this is true. But it’s a delicious healthy soup. 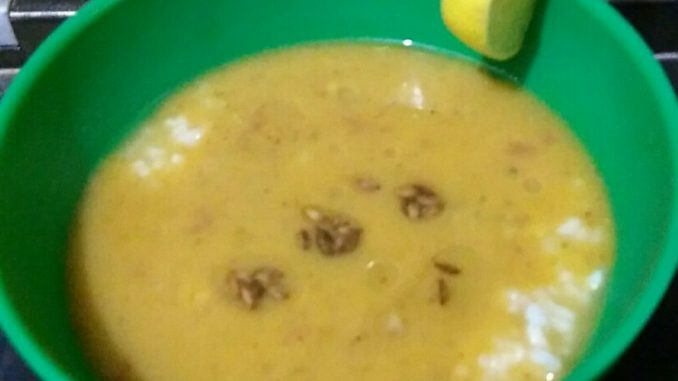 When I was searching for the recipe, I found 20-25 different recipes for Muligatawny soup. But I thought none of them would make the soup with the taste I was looking for. So I designed my own recipe and made this soup. It turned out to be awesome; just the way I wanted the taste and the texture. 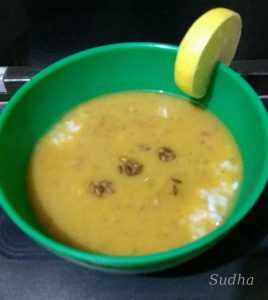 This soup is served with a spoon of cooked rice. Whenever I have this in restaurant, my husband teases me for having Dal Rice and he never had this soup. But yesterday, he liked this soup so much that he went for second helping. So, try this out. It would be very good in this weather. 4. In a pan, heat ghee (clarified butter). Add garlic. Sauté till light brown. Add curry leaves. Add chopped onion. Sauté till translucent. 7. Add 3 cups of water or vegetable stock . Bring the mixture to boil. 8. Crush the roasted spices and add to mixture. Add salt. 9. 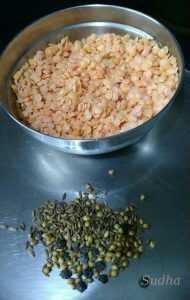 Keep cooking on low flame till Masoor dal is properly cooked. 11. Using a blender, blend the mixture into a smooth paste. 12. Transfer it to the pan and bring to boil. Adjust consistency by adding water as required. This is a thick soup. 13. While serving, add a teaspoon of cooked rice in soup bowl, pour soup and serve hot with a piece of fresh lemon. 14. Enjoy this delicious soup. हे मसूर डाळीचे सूप मूळचे दक्षिण भारतातलं पण भारताचे राष्ट्रीय सूप (National Soup of India) म्हणून ओळखलं जातं. मी खूप रेसिपीज पाहिल्या. पण मला हवी तशी चव येईल अशी कुठलीच रेसिपी दिसली नाही. मग माझ्या मनानेच रेसिपी बनवली आणि जशी हवी तशी चव मिळाली. हिवाळ्यात खायला अतिशय पौष्टिक आणि चविष्ट सूप आहे. ३. कांदा आणि टोमॅटो चिरून घ्या. लसूण सोलून तुकडे करून घ्या. ४. एका पातेल्यात तूप गरम करून त्यात लसूण घालून लालसर होईपर्यंत परता . कढीपत्ता घाला. कांदा घालून मऊ होईपर्यंत परतून घ्या. ७. ३ कप पाणी घालून उकळी आणा. ८. भाजलेले मसाले कुटून घ्या. आणि पातेल्यात घाला. ९. मंद आचेवर मसूर शिजेपर्यंत शिजवा. १०. गार झाल्यावर मिक्सर मध्ये पेस्ट करून घ्या. ११. परत पातेल्यात घालून जरुरीप्रमाणे पाणी घालून एक उकळी आणा. हे सूप दाट असते . १२. सर्व्ह करताना सूप बाउल मध्ये एक चमचा शिजलेला भात घाला, त्यावर सूप घाला आणि एक लिंबाचा काप ठेऊन गरम सूप सर्व्ह करा.